On 2 February, The Deputy Minister of Water and Environmental Affairs, Ms Rejoice Mabudafhasi, led South Africa’s World Wetlands Day celebrations at the Mbongolwane Sports Field, Eshowe, in KwaZulu-Natal. The Deputy Minister was joined by the KwaZulu-Natal MEC for Agriculture and Environmental Affairs, Dr BM Radebe; Executive Mayor of Uthungulu, Thembeka Mchunu; and Executive Mayor of Umlalazi, Thelumoya Zulu. During the celebrations, the Deputy Minister handed over a Ramsar certificate to Ezemvelo KZN Wildlife for the designation of uMgeni Vlei Nature Reserve as a wetland of international importance. South Africa designated uMgeni Vlei Nature Nature Reserve on the 19th of March 2013, bringing the total number of Wetlands of International Importance to 21, eight of which are in KwaZulu-Natal. The Ramsar Convention is an intergovernmental treaty that provides the framework for national action and international cooperation for the conservation and wise use of wetlands and their resources. World Wetlands Day is an annual event that commemorates the signing of the Convention on Wetlands on 02 February 1971 in the Iranian City of Ramsar. The annual celebration aims to amongst others raise awareness on the benefits of wetlands as a natural resource in communities. The theme for this year’s celebrations was Wetlands and Agriculture,under the slogan Partners for Growth. The key objective of the 2014 edition of World Wetlands Day was to raise people’s awareness of the inter-dependence between wetlands and agriculture; to highlight ways to ensure sustainable utilization of wetlands; and to promote the understanding that wetlands create an opportunity for small-scale farming when appropriate farming methods are used. Working for Wetlands is an Expanded Public Works Programme (EPWP) of government that focuses on remedial interventions for maintaining healthy wetlands. Since 2002, Working for Wetlands has invested R725 million in the rehabilitation of 1, 011 wetlands countrywide. This has improved or secured the health of more than 80,000 hectares of wetland area. As part of illustrating the relationship between wetlands and agriculture, and the benefits that this can bring to rural communities, a tour was taken during the celebrations to the Mbongolwane Wetlands in Eshowe. The wetland, which is approximately 395 hectares in extent and 12 kilometres long, was also selected to illustrate first-hand, the importance of conservation and sustainability of wetlands. Owing to the reasonably intact state of the wetland and the high level of human and agricultural activity in the catchment, the wetland is likely to have an important function in trapping sediment and improving water quality in the area. 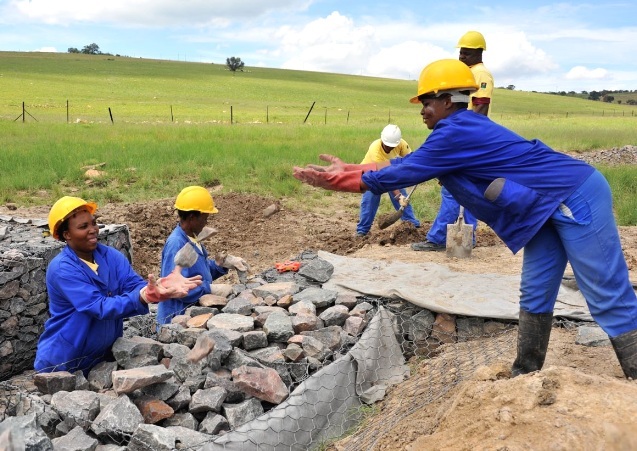 A number of organisations have supported the initiative of rehabilitating wetlands and their investments (such as Tongaat Hulett’s investment of R31 million towards the development of 1 182 hectares under the Manyazini, Thathunyawo and Sakhindlela Co-operatives) have enabled 120 community members to find employment as seasonal workers. During times of high activities, the number of seasonal workers increases to some 400 employees. In addition, 11 people have been employed permanently to ensure the day-to-day management of the sugarcane development initiatives. The wetlands celebrations this year were all the more significant as 2014 marks twenty years of democracy in South Africa. Over these two decades, the environment sector has made great strides as government and DEA have worked tirelessly towards the national vision of aprosperous and equitable society living in harmony with its natural resources. Click here to access the Deputy Minister’s speech.